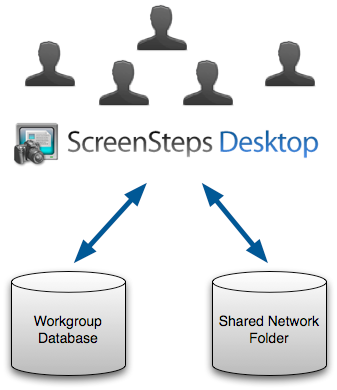 ScreenSteps Workgroup brings the speed and ease of ScreenSteps Desktop to a workgroup setting. 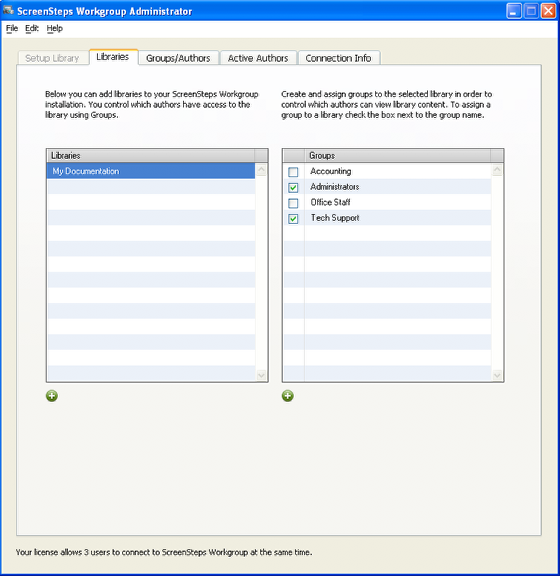 With ScreenSteps Workgroup multiple authors can work in the same ScreenSteps library without the risk of overwriting each others work. This lesson provides a brief overview of how ScreenSteps Workgroup works. ScreenSteps Desktop stores all of your manual and lesson textual data in the Workgroup Database. All lesson resources, such as images, are stored on a shared network folder. All authors have access to the same database and network folder they are always working on the same material. ScreenSteps enables multiple authors to work in the same library by allowing an author to checkout resources they are working on. While an author has a resource checked out only they can edit the properties of that resource. ScreenSteps Workgroup Administrator is the desktop application used to configure your ScreenSteps Workgroup installation. It allows you to create libraries and manage who has access to those libraries by means of groups and authors. It also allows you to see who is working on the library.